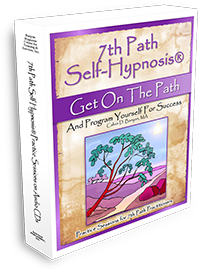 “7th Path” is a very special kind of self-hypnosis that came to me in a very inspired way. It is special for many reasons and here are but a few. 7th Path is the first “anti virus system” for the human mind. It works to remove old programs that have been accidentally installed in your subconscious mind which are getting you off track, slowing down your progress in life and generally causing you chronic unnecessary stress. This kind of stress is extremely unhealthy. Eliminating this chronic debilitating stress is one of the healthiest things that you can do. How long should I wait for the “Echo”? How do I know if I’m doing 7th Path Self-Hypnosis® correctly? How do I separate my self-talk from the “Echo”? What if all my “Echo’s” are only negative? How do I know I am ready to learn another Recognition, or a longer form? What if I have a thought or “Echo” while I’m still saying a Recognition? How deep in hypnosis do I need to be in order to do 7th Path Self-Hypnosis correctly? Why should I spend the same amount of time on all the Recognitions that I know, rather than just focusing on one or two? Why do you say that “7th Path doesn’t heal anything” when I’ve seen so many healing’s experienced when practicing 7th Path Self-Hypnosis®? How long does one have to practice 7th Path Self-Hypnosis® before I become a teacher? Can we teach 7th Path Self-Hypnosis over the phone? How can I learn the Ultimate Recognitions as a practitioner or teacher? Do all students get a 7th Path Self-Hypnosis® student booklet? If I have the Full Form or Ultimate Form of the Recognitions, should I use them or can I just use the Short Forms? If a teacher is only able to teach the Short Forms of the Recognitions to a particular student (because of time restrictions) should he or she do so? What are the various ways to teach 7th Path Self-Hypnosis®? How would you lead a 7th Path Community in the group practice of the Recognitions when each participant has a different number of Recognitions?